Lost Planet 3 was only just released worldwide for the PlayStation 3 and the Xbox 360. The Lost Planet franchise is one of Capcom’s most popular franchises, alongside a few others, and there’s a real serious fan-base behind the series, you can definitely see why though; giant monsters, awesome weapons, grappling hooks, they’re all awesome things that gamers love. Now we’ve been given a Lost Planet comic book and I’m sure fans of the games and the franchise itself are pretty pumped to get their hands on a bit more of that Akrid-killing action. 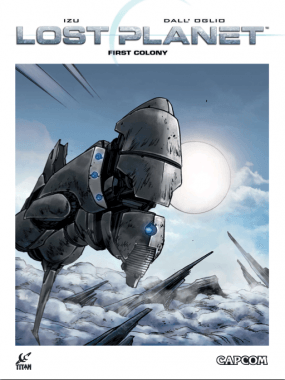 Lost Planet: First Colony is here, it’s a small comic but it gives fans of the game a little more insight into what happened before the actual games themselves. Here we have issue two and, well, read on to see how well (or not so well) it turned out. Issue Two kicks off exactly where Issue One ended so if you aren’t up to date head here to check out my review of Issue One. We’re thrown right back into the deadly tundra as we journey with what is left of the team which, at this point in time, is three of God knows how many from the ship. The tension between the three has grown thick and you can tell because the characters aren’t exactly subtle about it, there’s a lot of yelling and name-calling yet the captain is still enough of a leader to risk her life for the other two. They continue on despite being one man down. They make camp for the night and a bit more character development is shown when the commander, half asleep, springs to action when woken up. It’s something small but it shows a great deal of Jane, personality-wise. She’s a soldier, a mercenary, a killer and even while sleeping or “resting” she uses instinct to defend herself, if anything it brings her closer to the Akrid around her considering they both work off of their instincts and reactions. I just thought it was a nice touch. After their little camp is attacked by Akrid, the team meets a group of “former” NEVEC soldiers who help them out of a jam but on the condition that they come aboard the ship to help them get off of the planet. This is where the plot thickens and this is where I started to enjoy this comic a lot more than the first issue. I’m not going to say too much at all because this is where it all happens, at this point in time we’re getting real close to the end of the comic yet this is where all the substance is. We’re introduced to T-ENG which you’d know from the game; it is the main source of power for the soldiers and it is harvested from the corpses of the Akrids, within the comic this has just been discovered which is where the “origins” side of things comes in to play. It’s nice to have seen something like this because it’s such a big focal point within the games. One of the characters even mentions that the T-ENG is what will draw scavengers and bandits as well as soldiers to the planet, which is a major reference to the series of games. Already this comic has outdone it’s predecessor when it comes to substance. We’re introduced to another key character and a fair bit of information is released with regards to the story and what is to come of it. I love the way it ends because it flat out says “To Be Continued…In Lost Planet 3”. It went down exactly as I hoped it did and, while it still seemed rushed and characters didn’t exactly interact well, it made up for what Issue One Lacked. 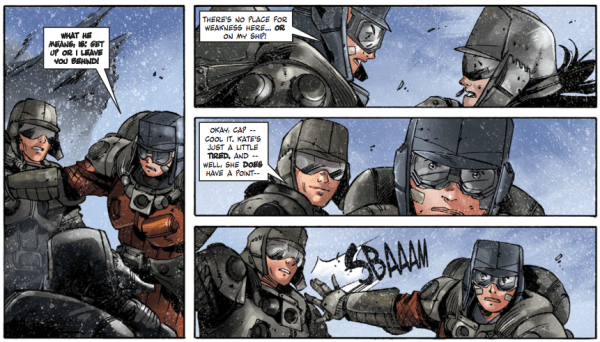 Just trust me when I say that the comics are great as part of a franchise, if these were just the comics on their own, they really wouldn’t hold up very well but considering it’s just a little add-on to the Lost Planet name, they are a nice touch. What can I say about the artwork that hasn’t already been said? We see a lot less of the outside environments, the last half of the comic takes place within a semi-secure compound, I believe it used to be a ship that crashed and was turned into a safe living area and that’s exactly what it looked like so they got it spot on. We got to see more of the actual people without the constant environment hazards around them and it was a nice change of pace. The biggest thing to stick out, for me, was the way the glow of the T-ENG was illustrated , they somehow made it look like it had a solid form yet it was also somewhat gassy and beaming with light, they managed to make the actual thing look warm, it’s called Thermal Energy and they made it look warm…all I have to say is “Well done!”. The art style never really changed from issue to issue, I think they were illustrated close to each other so there was no time for the artist’s style to change, it was also set in a less-chaotic environment so the illustrator had less of a chance to go wild with the art. That doesn’t mean it still wasn’t great though! It sticks to the same level as it did in the first issue, which was fantastic so no complaints here! Let me lay it down for you, big time: You cannot just read half of this comic, you can’t, if you’re going to invest in this comic you have to read the whole thing because just reading the first half doesn’t do the complete title justice. Look I’m not saying this is the greatest story in a comic, even in the second half it’s still poor for the most part, but for the other parts that are good and have a great deal of substance, it’s worth reading the entire thing. It’s great for fans of the series and it leads into Lost Planet 3 just as well as I thought it would in my last review. Give it a shot. I’ll leave you with one thing: Some comics take the integrity of a series and just crumble it, this one does not, Lost Planet First Colony was done in a way that, while it doesn’t blow you away, it also doesn’t make you dislike the series. It’s intention was to inform fans just that little bit more and that’s exactly what it did, yes it had the potential to be better but we can’t have everything.